The biggest mistake men make is either they dress too younger or too older without considering their age. Moreover, fashion stylist tells you many fashion blunders which men make and this is one of them. Wherein people in their early 20's have their own problems in dressing up, they take some style clues from their dad and tend to look mature. On the other side, people in their 30s takes the challenge of dressing up like adulthood by choosing colors not appropriate for their age. Invest in basics: make sure you choose those clothes which can be worn on normal days too. A pair of jeans, dress shirts and a tailored blazer. You will require these when you are in doubt. Fit is key: you are not 18 anymore, so it's not necessary to act cool with your dressing sense. Your torso should fit properly not tightly and your shoulder must fit properly, it should not fall down. No logos: no one is saying you to be a billboard, so why advertising clothing brands on your style. This would be appropriate only if they are giving you money. Otherwise pick clothes that are plain not funky – you are not in your high school. Formal: we already know that black is your best friend and trend of wearing black never goes out of style. A two button black color suit with side vents is a perfect pick. Slip it with a French-cuffed shirt, leather lace-ups and a pocket square or a bow tie. You are now ready for any formal occasion or event. Develop a unique style: It's not necessary to follow the trend which is latest, no one is stopping you from creating one for yourself or the way in which you are comfortable. Be it monogrammed shirts or suit jackets with bright or thick lining. Wear what suits you according to your age. This will help in making you look simple yet sophisticated. Be selective: selective here doesn't mean you will be a typical choosy. Take your time and check if the outfit suits you or not, if the sleeves have the stitching or not, and if the collar is fitting you properly or not. Little things are very important when it comes to style an outfit. Keep a list of Don't: always remember, there are few things which you can't wear because of your age like jeans that sag down your waist, crocs, Ed Hardy shirts, and wristbands. Please don't buy and in case if you have either throw them or don't wear. 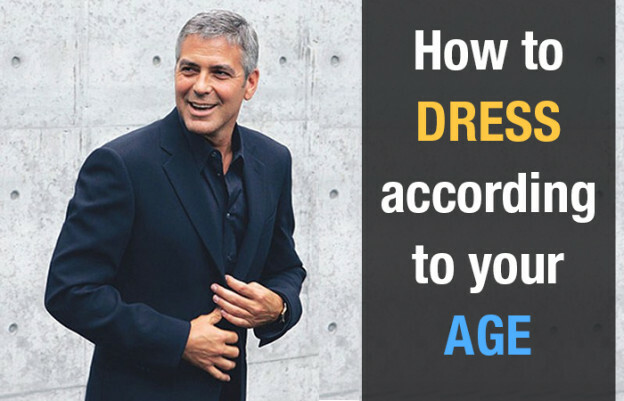 On That Note: Enhance your style with our guide and rock your age.